While Mido seems to be quite good at producing watches that look anonymous at best, this new stainless steel Mido Multifort Two Crowns (Ref. M005.930.11.060.00) actually looks nice and even recognizable, although even this design always leaves you scratching your head trying to remember if you have already seen this gadget before. The thing that makes this watch recognizable is, of course, the signature vertical Geneva stripes pattern that decorates its anthracite dial, as well as the usual dot-shaped hour markers with a single Arabic numeral at 12 hours. The thing that awakens that irritating feeling of deja vu is, for sure, the rotating inner bezel that features a diving scale painted on it in white and orange Superluminova. The design seems to becoming a fad among both watchmakers and watch enthusiasts and there are already numerous watches (like this 2013 Eberhad & Co. Scafodat 500 or the techy Ball Watch Engineer Master II) on the market that feature the same inner bezel, which is operated by an extra crown usually placed at 2 hours for better reach. Although the timepiece doesn’t look especially inspiring, it is not terribly boring either. For starters, it doesn’t look like yet another ‘respectful’ homage to either a Submariner or a Seamaster. Its body is well-designed and quite ergonomic, the crowns are just large enough for easy grip, and the dial layout with its simple Day/Date calendar is clean and easy to read in any lighting condition. 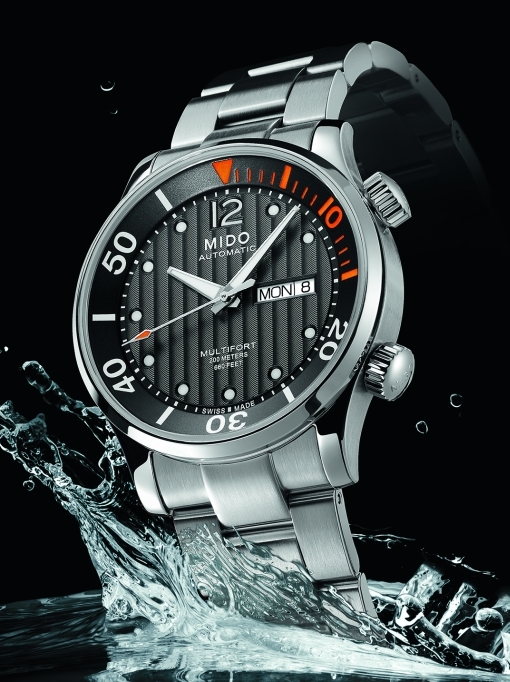 Like many watches featuring this functionality, the Mido Multifort Two Crowns is animated with a well-known ETA 2836-2 automatic movement (actually, the same mechanism that powered the aforementioned Ball Engineer Master II) that comes with a modified oscillating weight that, again, features the same Geneva stripes and Mido logo, and blued screws that make it look even more noble. The caliber, by the way, is clearly visible through a transparent case-back. Of course, these minor modifications don’t really make the mechanism a piece of art: besides the decorated rotor and the screw heads, the rest of the mechanism looks more or less stock and rather plain. Still, for the price niche it occupies, the level of decor is more than acceptable. Also, this mechanism is known for its reliability and high accuracy and is what it is: a workhorse caliber that gets the job done with absolutely no hassle. All you need for it to keep counting best seconds of your life is to service it at proper intervals of time. And even if something goes wrong, it won’t be a problem to fix it at the nearest authorized service station. At 42 millimeters in diameter, the case is large, but not excessively so. Although it will take a great deal of space on your wrist, it is also quite thin measuring less than 12 millimeters top to bottom: you shirt’s cuff will love that. Both crowns are ergonomically placed and the integrated lugs are just short enough for the watch hug your wrist gently. For my taste, there are a bit too many polished surfaces on this piece: something that you don’t really expect from a tool watch, but at least they give you a feeling of quality and even a certain luxury: it clearly doesn’t look like those German divers with their exaggeratedly practical appearance. As you can see, the dial is clean and easily readable thanks to its high contrast layout. While the grade of Superluminova compound that Mido used for this model doesn’t seem to be overly bright (and it certainly won’t be able to compete with watches featuring tritium micro-tubes), it is still bright enough to be easily readable in darkness. I am just not sure about the color scheme of the lume: I don’t really like the way its turquoise lume on the hands and hour markers interacts with an unpleasant shade of green on the bezel and central seconds hand. But that’s totally a matter of personal taste. Of course, everything that I have written above relates only to this model in polished and machine-brushed stainless steel that seems to be worth every penny that the brand will charge for it (as far as I understand, the watch will be offered below the €1500 mark). The version in PVD gold looks pretentious and stupid: don’t waste your money on it. The watch will be presented later this year at Baselworld 2014 event.